Leonard’s Bakery on Kapahulu Street in Honolulu, Hawaii has sweetened up locals and tourists alike with their ono malasadas since 1952. 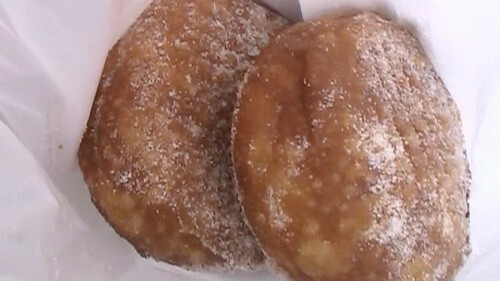 Portugese malasada pastries are tennis ball sized fried dough rolled in plain sugar or cinnamon sugar and served warm. Malasada puffs are filled with custard, haupia, dobash, macadamia, lilikoi, mango, guava, pineapple or banana filling. Each time we visit, a line of customers snakes through the store past the breads, cakes, doughnuts, cookies, wraps and malasadas. Many customers order two or three dozen malasadas to delight family and friends. Fortunately, in a few minutes it is my turn to order. I prefer the plain sugar malasadas but the cinnamon sugar runs a close second. We head for the benches outside the door to savor our sweet treats. The malasadas are toasty hot as we take them out of the bag and devour these delights. In just a moment, all that is left is a sprinkling of sugar over our fingers and a smile on our faces. 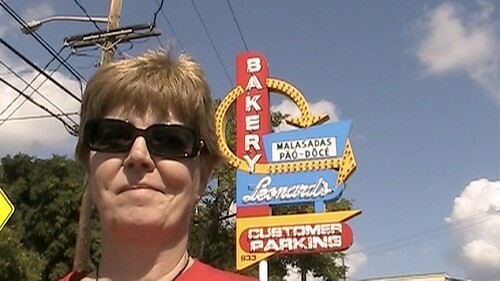 If you are on Oahu, Hawaii stop by Leonard’s Bakery in Honolulu in the Kapahulu neighborhood, a short walk from Waikiki. Visit their second store in Aiea or the Malasadamobiles in Waipahu. For those in Japan, check out Leonard’s Bakery in Yokohama, Japan. Click on the image below to view this episode of “Where Are You Today?” as we visit Leonard’s Bakery on Kapahulu Street in Honolulu. Click on “Comments” and tell us which is your favorite malasada flavor.